There are many wonders, natural phenomenon, and marvelous places that drive tourists to have a Sahara Desert holiday. Morocco is among the most marvelous places to have a wonderful Sahara desert tours Morocco. It doesn’t really matter if you ride in 4X4 vehicles or go on a ride on the back of a camel, you would get the chance to have a memorable experience. It is always advisable for tourists, especially those coming from far destinations, to have a holiday exploring some of the imperial cities of Morocco like Fes, Rabat, and Marrakesh and then go on an adventure in a Sahara tour Morocco. There are plenty of Moroccan cities and oases that are located at the heart of the desert or its borders. 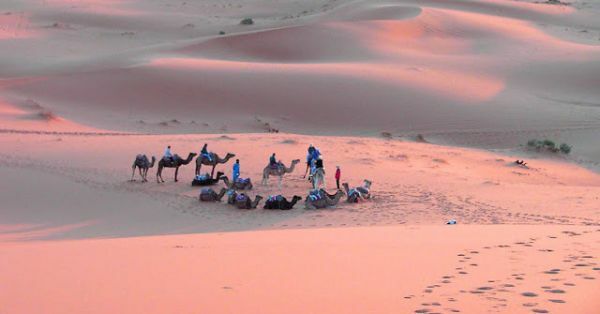 Desert safaris are quite popular among tourists who travel to Morocco. Ait Ben Haddou is one of the finest examples of places that should never be missed during a Sahara desert tours Morocco. This old fortified village was a significantly important transit point for commercial caravans between the Moroccan deserts and the city of Marrakesh. Afterwards, it was used to shoot a large number of internationally popular films including Gladiator, the Mummy, Kingdom of Heaven, and Alexander. Dades Gorges or the Dades Valley is yet another area of attraction in the Moroccan deserts. This area is famous for its rounded routs and the colorful rocks and stones scattered all around it. There is also the famous Erg Chebbi, one of the largest sand seas in the country where tourists can view sand dunes that are more than 15 meters high. The oases that tourists enjoying their Sahara Desert holiday should always explore include Rissani and Ouarzazate. These two centers offer many marvelous experiences including mingling with the Bedouins and some monuments as well.